Consolidated Notes: Types 1, 2, 3, 4, 5, 6, 7, 8. 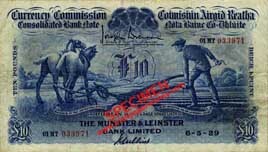 The Consolidated Banknote issue was created as a means to replace the banknotes in circulation in the Irish Free State, issued by the six Irish Joint-Stock banks that had the right of note issue under British rule. However, the Consolidated note issue extended this right to all eight Joint Stock commercial banks operating within the Irish Free State. 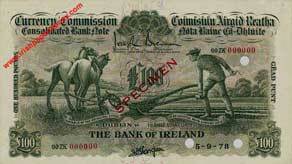 The remaining bank, The Belfast Banking company, which had issued Old Notes prior to 1929, withdrew from the Irish Free State, selling all its branches to the Royal Bank of Ireland. Consolidated Banknotes were regulated by the Currency Commission, and were never Legal Tender, merely a promise to pay such. 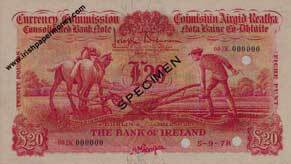 The Central Bank Act, 1942 established the The Central Bank of Ireland in place of the Currency Commission and provided for the withdrawal of the right of note issue from the commercial banks, leaving the A Series Legal Tender Notes the only notes issued in Ireland. The Consolidated Banknote issue commenced in 1929 and ceased on 31.12.53 when the total aggregate amount permissible of notes of all the banks reached zero after a steady period of reduction. Note: the dimensions tended to vary by a few millimetres, depending on the cut. £50 Note, 203 x 114 mm; £100 Note, 203 x 114 mm.